We eat a lot of granola in our house. Normally, we pile Whole Foods' Housemade Cherry Almond Granola onto a heap of Bellweather Farms' Vanilla Bean Yogurt and gleefully spoon it into our mouths. At $5 or $6 per container of granola - which lasted us maybe 4 meals - this was getting expensive! Naturally, I had to find another solution. Some recipes use oil rather than butter or omit fats altogether, some use fruit juice instead of sugar and that's cool, but not really for us. I'm a pretty firm believer that everything in moderation is perfection, so, we're not sugar-free nor fat-free nor, really, anything-free in this household. 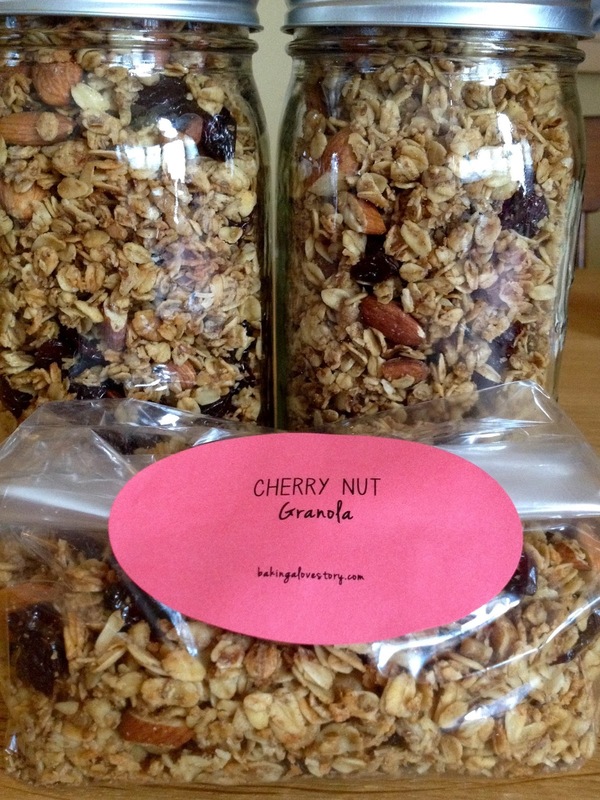 I just wanted a nutty, not too sweet, mostly healthful, toasted granola with my favorite additions (cherry, almond, walnut, coconut) to serve for breakfast or late afternoon snacks. Dana Slatkin writes the closest-to-perfect recipe (in my humble opinion) in The Summertime Anytime Cookbook that she wrote for Shutters on the Beach so I co-opted that and messed with it until it had all the variables I wanted. This recipe also happens to be gluten free for those who are so inclined. 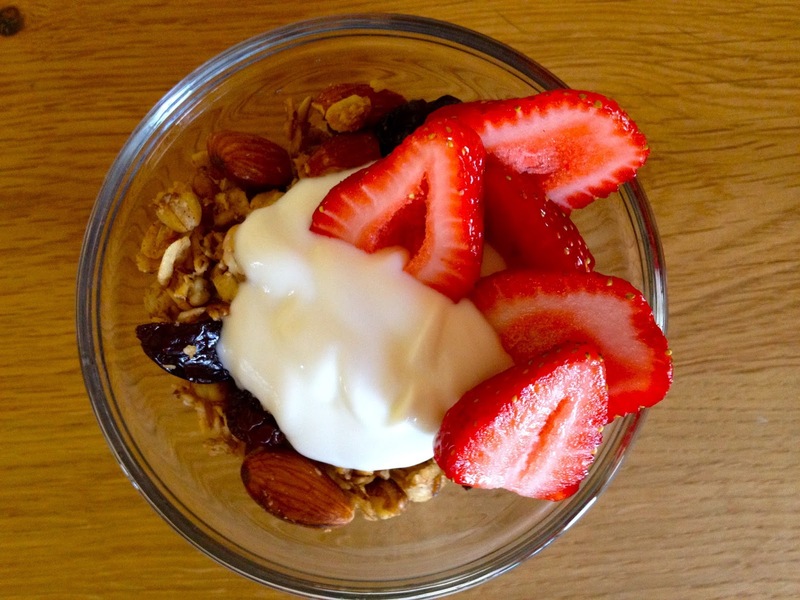 This recipe turned out delicious granola. I might like it a wee bit clumpier, but perhaps the next round will yield that result. In the meantime, please feel free to halve this recipe as it makes enough granola for your family, the neighbors, their in-laws and your co-workers. Pre-heat the oven to 300. Mix the butter, oil, juice and syrup together and set aside. Mix everything else together, omitting the cherries. Pour the liquid mixture into the dry mixture and stir until nicely blended. Pour onto 2 baking sheets and flatten out, evenly distributing the granola across the sheets. Bake for 30 minutes and stir. Bake another 15 minutes. Add the cherries in and stir again. Bake an additional 15 minutes (total baking time is one hour), remove from oven and let cool completely on the counter. Break up the granola again once cooled and try to resist popping it into your mouth as you put it into bags or jars for storage or giving. This recipe is pretty easy to modify. If you want nut-free, don't add nuts. If you like raisins but not coconut, add raisins and omit coconut. 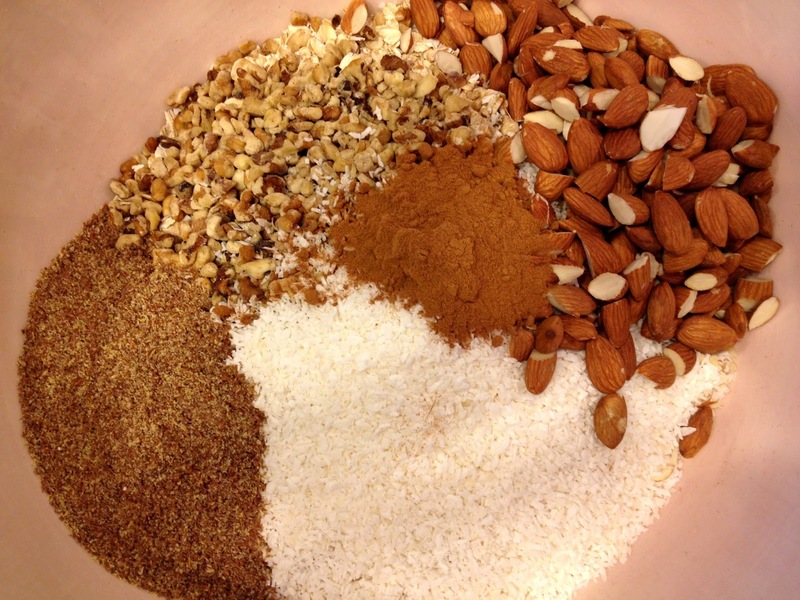 Whatever you like, this oat base will give you leeway to try it out. We've been eating it like mad, so, maybe the 10 cup quantity is actually okay for our family. Let me know how yours likes it! Thank you so much for your kind words and for visiting me here. Hope to see more of you!